Transform your soft saddlebag for sound! CS-141: Road King Classic Leather Saddlebag Speaker Bezels (Complete). 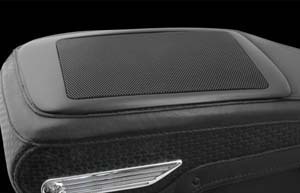 Easily transform OEM leather saddlebags into a custom audio package made for maximum volume and performance. 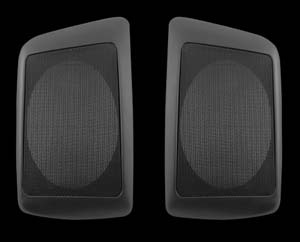 The new Bagger Audio™ saddlebag speaker bezel system is a sure way to get maximum volume from your bagger. Designed specifically for the Road King Classic leather saddlebags our bezel system allows the addition of 6” x 9” speakers to your existing bags. 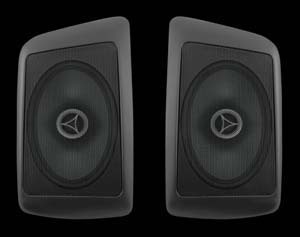 Using marine grade speakers, waterproof amplifier and a revolutionary hydrophobic speaker grill design, our bezel system is engineered to hold up in real world conditions. 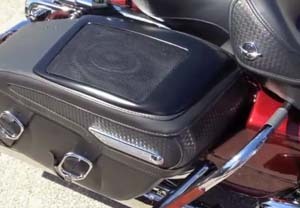 Designed as a direct drop-in for standard Harley Davidson leather bags our bezel system perfectly integrates 6” x 9” speakers into the saddlebags without changing the look of the bike, adding bulk or reducing storage space. Waterproofed by a revolutionary speaker grill, there is no need to worry about moisture getting to the electronics or your cargo. Speaker wiring includes a quick disconnect design for easy removal of saddlebags with speakers in place. Complete kit comes with speakers, amplifier and all wiring needed to complete installation.